I just received my copy of Religion and Place: landscape, politics, piety put out by Springer and set for a 2013 release date. 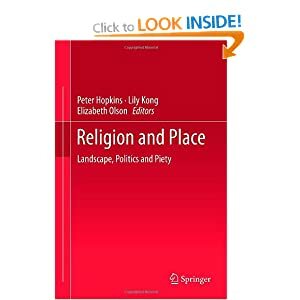 It’s edited by my friends, Peter Hopkins (Newcastle University, Geography), Lily Kong (National University of Singapore, Geography), and Betsy Olson (University of North Carolina–Chapel Hill, Geography), and it’s got a great line-up of geographers of religion contributing in its various chapters, including Banu Gokariksel, Anna Secor, Sarah Moser, Nimrod Luz, Lynn Staeheli, Caroline Nagel, Barbara Bompani, Giselle Vincett, David Conradson, and Julian Holloway. My supervisor, David Ley (University of British Columbia, Geography), and I co-authored a chapter entitled “Homo religiosus? Religion and immigrant subjectivities” based on Ley’s 2010 lecture for the Association of American Geographers’ Geography of Religions and Belief Systems annual lecture series. I contributed a great deal of citations to make the chapter relevant to theology and religious studies (fields that Lily Kong  has been pushing us to get involved in) as well as some empirical material on Chinese Canadian evangelicals, especially from my 2011 article on a Cantonese Christian congregation published in Population, Space, and Place. Our chapter suggests that while there has been a great deal of interest in the relationship between religion and migration, little has been done from within the theological frameworks of religious migrant practitioners themselves. We attempt a thought-experiment with transnational Chinese migrants to Vancouver who attend Christian churches to examine their religious practices from an explicitly theological perspective. One of the innovative elements of this book is its explicit openness to doing social science of religion from within theological frameworks, as can also be seen from Julian Holloway’s chapter. To me, this raises questions about how human geographers do religious studies similarly and differently from their social science counterparts in sociology and anthropology. The editors and the contributors are very excited about the release of this book, as it signals a growing interest within human geography in religion and the growing significance of various approaches to religious studies in the social sciences more generally. We invite graduate students with an interest in trans-Pacific migration to attend and present a paper at a conference in Vancouver in June 2010. The conference focuses on the construction and maintenance of identities in the Pacific region from political, economic, and socio-cultural perspectives. 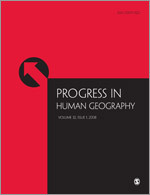 Recent literature on nation-states, transnational networks, economic integration, and late capitalist logics of governmentality in the Pacific region have identified phenomena that are said to include rapid urbanization, the emergence of nationalisms, technological advances, increases in the speed of information, and the formation of transnational networks through migration and media. How has the emergence of such Pacific worlds in motion affected the construction, maintenance, and imagination of identities in the Pacific region? Have identities also become mobile in trans-Pacific worlds in motion? What kinds of political, economic, and social identities have emerged from such mobility, and how are they to be discussed? This four-day conference will include two days of papers and a day trip to Richmond, BC, a Chinese ethnoburb south of Vancouver that will serve as a local site to ground discussion on Pacific mobile identities. Our hope is to begin and continue a discussion on these Pacific identities in motion from a variety of perspectives as we seek to understand more fully our present experience of Pacific worlds in motion. Pacific Worlds in Motion is sponsored by one of the University of British Columbia’s graduate residential colleges (St. John’s College). It aims to bring together graduate students and early career researchers from all disciplines pursuing research on Pacific Migrations. Preference will be given to those who have chosen topics that explicitly deal with questions and issues specifically pertaining to the issue of Pacific identities in motion. We hope that this conference will begin mentoring relationships among senior scholars, early career researchers, and graduate students.